He’s brilliant, neurotic and alarmingly close to unbalanced. Dr Precarious is an up and coming super villain. Through the eyes of Marissa, his new side-kick, discover his curious world. I’ve written this first novel as an experiment in detailed and descriptive writing. It is not typical of my usual style and like in the old days of vinyl records, this is my B-side novel. It is quite possible that I’ve had more fun writing it, than you’ll have reading it. I dare you to see if you don’t. I know it seems like some satirical spoof, but it is nothing that serious. I’ve discovered a lot by playing with detailed description and if that interests you, go have a look. But this is not a fast passed book full of thrills and designed to entertain. What pleasure it does provide comes through the insights of introspection, the curious inventions, and unusual behaviours that can evolve when money protects. 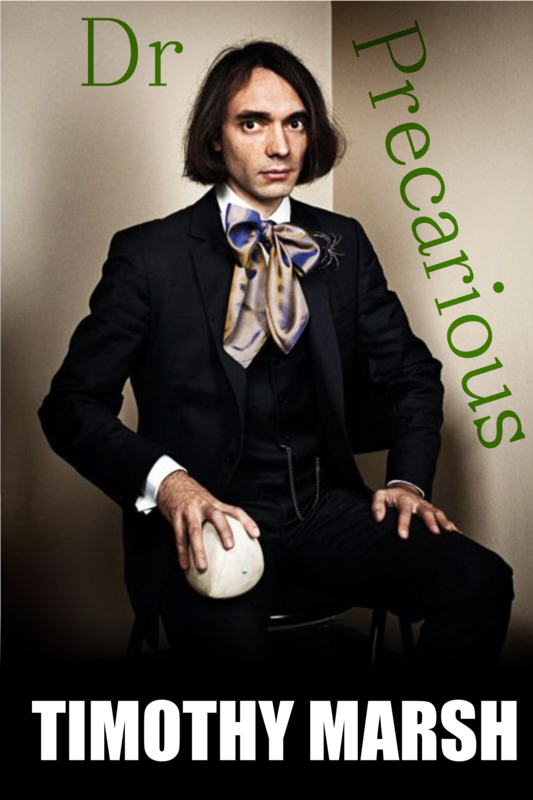 Dr Precarous is a 75,000 word novel about a the side kick to a super villain, discovering who she is. Marissa is the tragic result of a childhood wrapped in cotton-wool. Never out of adult supervision, never allowed to be bored, never having to motivate herself or even make decisions, she’s a terrifying example of what fear based parenting can create. Watch her grow as she develops hidden talents, makes real friendships, and learns what it means to fear, admire, and despise on of the most brilliant minds of her time. Currently Dr Precarious is being published whenever I finish editing each chapter, often a few at a time, on Wattpad. This is a great way to get feedback from beta-readers, but not a convenient or comfortable way to read a book. After it is finished this stage, it will be published as an eBook on Smashwords which makes it available on all popular devices and retailers except Amazon. Note: Not available through Amazon due to their desire to be the exclusive publisher. Kindle version, free of DRM, will be available through Smashwords. Note: This section and beyond contains spoilers. Q: Is he in love with Marissa? A: Not yet. He’s got a lot of emotional issues to work through and at times he’ll believe he is in love with her, but see that as an unbalancing force.